CQ WPX RTTY and memories. So there I was early Saturday afternoon wondering what to do with myself before the England-Italy match kicked off. The CQ WPX RTTY contest was on, so I sat down in the shack, installed Fldigi, and configured it to work with my K3. I have a 15m Inverted V Dipole up which is my best antenna, so I operated in Search and Pounce (S&P) for a bit and was working away nicely with no real issues other than the operator hitting the wrong keys on the keyboard. Last time I operated a RTTY contest from home like this I was using a Kenwood TS-2000X, I was very very disappointed with the radio at the time, so much so that I sold it pretty quickly afterwards. It appeared to suffer badly with strong signals capturing the automatic gain control (AGC) and completely blocking out out the weaker stations. The K3 was having no such issues (thankfully). This left me with a quandary. What do do about the Rugby? Well, my Intel Nuc has a Mini DP connector so I borrowed the screen from my Mac Mini, opened up RTE Live on it and voila! I took a break from the contest for the Ireland-France game and resumed afterwards, finishing up with about 130 contacts (QSOs) in the log by Saturday evening. I did not feel well Sunday morning, so I gave myself the modest goal of 200 QSOs. After a break to watch Scotland get robbed of a win against Wales, I ran for a bit, then hit 250 Q’s, returned to S&P again then 300, finally deciding that I had enough done at 329. That said, I really really missed having a bandmap. A band map is a display of recent DX spots by frequency. You can see one in the middle of the picture below. This display is user-configurable in many ways including the length of time to display, the frequencies to include, etc. It lets you see at a glance what activity is on the selected band and, if you see a station you really really really want to get into your log. You can pounce with a click of the mouse. 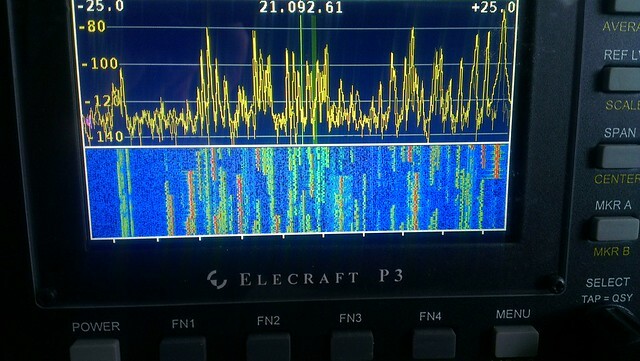 Last year after listening to the LHS guys interview Petr, OK2CQR, I was convinced to give CQRLOG a go. I have gotten so used to its bandmap that really missed it. Screenshot of OK2CQR’s Desktop showing cqrlog. After the contest I was chatting to G0HWW on IRC about my issue and he pointed me at an old blog post of his (thanks Darren), initial testing seems promising but rigctld seems to exit with errors now and again. More work is needed I think. Sunday afternoon, in the melee, I was running and a callsign appeared on my screen that seemed familiar, N9TGR. I responded with my normal report and was trying to figure out how I knew the callsign. I saw the other stations report appear on the screen and at the end of it was “UP THE DUBS”. The penny dropped. In 2009 I travelled to Chicago to present at the ARRL and TAPR Digital Communications Conference, somehow Andy Ronan, N9TGR (a dub, and no relation that we know of and also EI6KG), got wind I was going to be there and suggested that I call out for dinner with him and his family one of the evenings while I was there. I also remember joking it would be highly unlikely that we would ever meet up on air! Suffice it to say I spent a most enjoyable evening with Andy and his family, they showed great hospitality, great memories!